Parking for Med Inn is in Parking Structure P2. Remember the level on which you parked. If you will be visiting for more than 4 hours, bring your parking coupon with you to your appointment to be validated at the information desks for a reduced rate. Take the parking structure elevator P2 to Floor 2. Turn right after exiting the elevator and enter the Taubman Center, passing the Information Desk and taking the corridor to your right. When the corridor ends, turn left. Enter University Hospital and follow the main corridor left, until you see the courtyard on your left. Continue along the courtyard and turn leftt into the 1st hallway. You are now in the Med Inn Building. *Detailed directions to services located on Floor 2 of the Med Inn Building are listed below. Look for signage to assist you in finding your location. 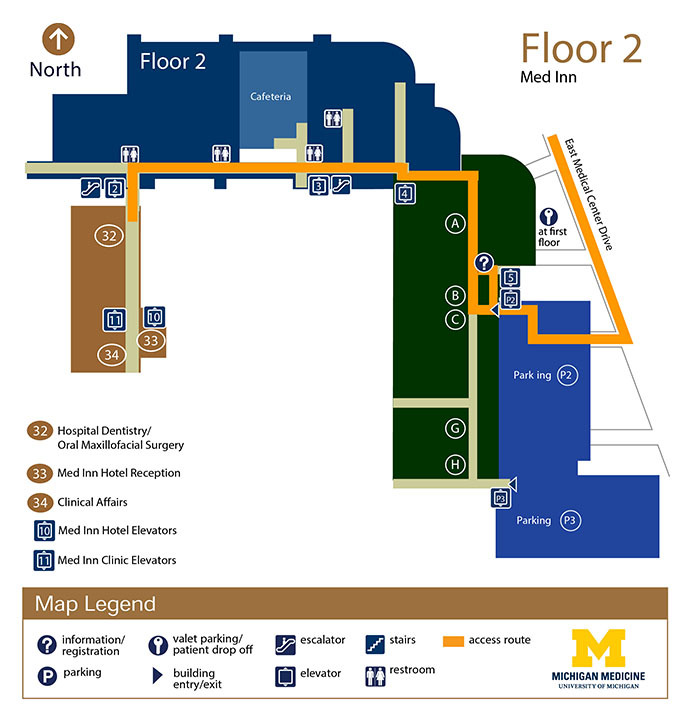 The Med Inn Hotel Lobby and Registration Desk are located on the left of the hallway coming from University Hospital, adjacent to Elevator 10. For reservations call (800) 544-8684.